WWI Red Baron and his fellow pilots. It's a cool, misty morning in April 1918 at the Jagdstaffel 11 airfield in Cappy. The Staffel's morning flight of colorful triplanes has just been rolled out and positioned for takeoff. 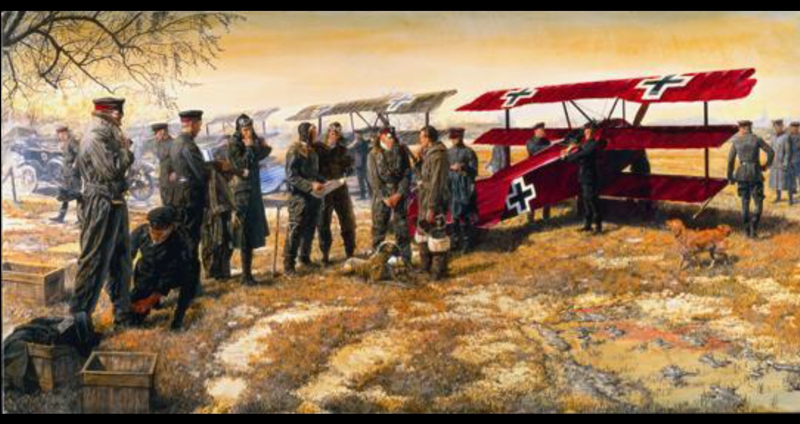 Among them, the blood-red Fokker DRI belonging to the commander of Jagdgeschwader I, Baron Manfred von Richthofen, receives some last-minute attention from its ground crew. As the overcast lifts, the famous - or infamous - Red Baron himself engages in a little preflight repartee and gives final orders to the pilots who will fly into combat with him. Other pilots are helped by the ground crew as they climb into bulky flight suits. Richthofen's dog, Moritz, waits - patiently, for a change - for his master's goodbye. Both the man and his aircraft were nearing the end of their careers at the front. After a morning much like the one pictured here, von Richthofen would lose his life in combat over the Somme, on April 21. After a swirling dogfight, he chased a lone Sopwith Camel piloted by Canadian Wop May, down low over Allied lines, disregarding one of his own combat dictums. Unbeknown to him until it was too late, he was being chased by another Sopwith Camel flown by A. Roy Brown. During those last few moments, while concentrating on the Camel in front of him, he and his aircraft were subjected to streams of ground fire and fire from Brown's aircraft. The result was a fatal wound and the crash of von Richthofen's DRI near Allied lines. His body and aircraft were later recovered by Australian troops, and the ultimate victor over the Red Baron has been in debate ever since.